We have three carry in rigs capable of recording up to 128 channels of audio in either live or studio situations. In addition, our mobile recording truck can record up to 192 channels. We have experience in recording audio for CD, radio, TV, webcasting and can undertake such work anywhere in the world. We can run up to four simultaneous recording projects and can offer fully crewed sessions and recordings or supply rigs as a dry hire. 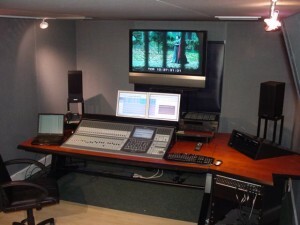 At our West London premises we have three of the highest quality post production suites in the UK. The three editing rooms are fully sound proofed with floating floors and air conditioning. In addition there is a transfer and re-mastering room available plus mixing facilities including 5.1 rooms and mixing to picture. With Pyramix available as standard and other platforms available on request, we can cater for all your needs. As well as editing and mixing many of the projects we record, we also offer post production services for external clients from single artists to major record labels. We can handle almost any format of source material and out put final masters to any destination. Our re-mastering services include transfer from any format. All our engineers have worked in all of the UK’s most prestigious recording studios. We are able to offer competitive rates for supplying engineering services in these studios, or will organize our client’s studio bookings on a non-comission basis. We have a number of in-house producers, who between them have a vast experience in different types of recording situation. They have worked for many different record labels with many different artists, and are used to adapting their production styles to suit the circumstances. Depending on the client’s requirements we can suggest whoever we feel may be most suitable. Having access to the best producers around means we can select the one best suited to any particular project. In addition to live concert recording, we offer an instant CD service where the recording can be sold and taken away at the end of the concert. This could be from a dozen CDs up to many hundreds made available with minutes of the concert finishing. We will organize all aspects of recording projects to a clients specification. We can book artists, venues, engineers, editors and producers and organise the entire project through to finished CD. We can advise or artwork design and obtain CD pressing runs from as little as 50 units to order. We also offer an executive production service, whereby we can initiate and co-ordinate recording projects for license or sale to record labels and broadcasting organisations. We have close contacts with all the major record labels, and can often pre sell artists’ ideas to prospective record companies. Floating Earth is an experienced independent producer for radio and has been involved with numerous TV productions. We frequently supply recording and broadcast facilities to other independent producers. These commissions can involve production, engineering, editing, presenting and mixing. For live to air broadcasts we can make all the necessary arrangement for satellite feed and live link-ups. or call +44 (0) 20 8997 4000.